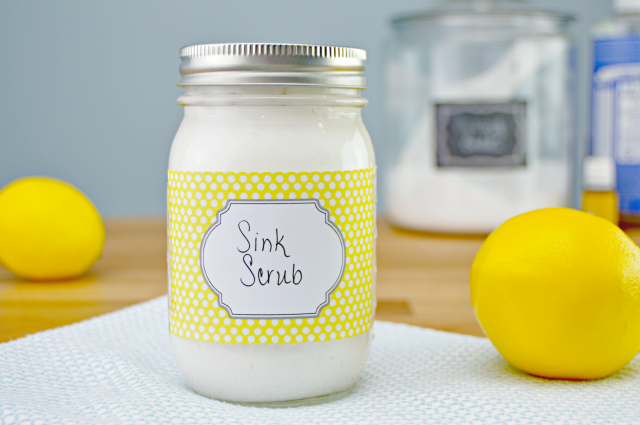 Homemade sink cleaner scrub is easy to make and will leave your sink sparkling clean as well as stain and scratch free! This post contains affiliate links, which means if you make a purchase, I will get a small commission. 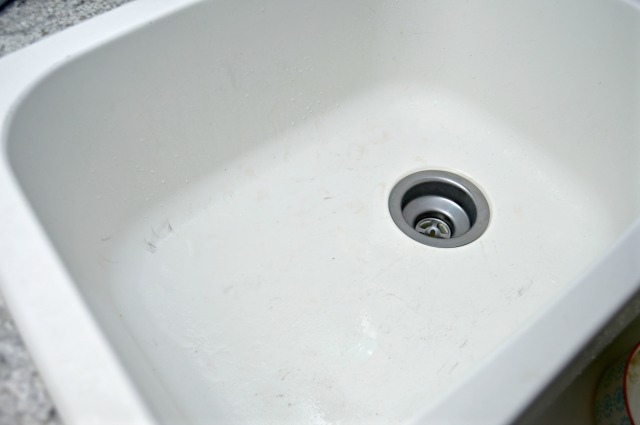 With the new popularity of white farm sinks, I thought it would be a good time to share the homemade sink cleaning scrub that I use to clean my white sink. This is the same scrub that I used to clean my stainless steel sink when I had one too. 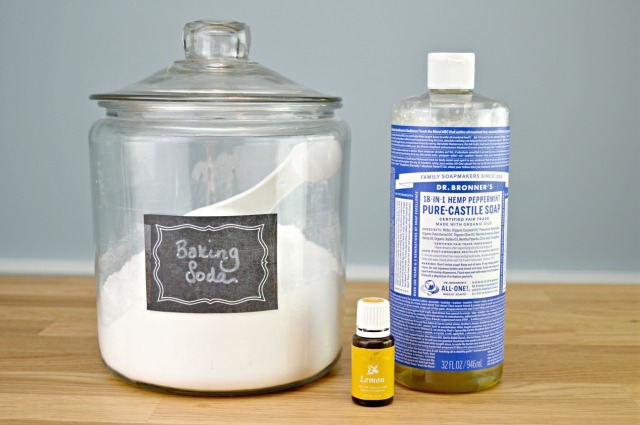 It’s so easy to make and will get all of those stains, smudges and scratches off with ease. It’s super gentle, but really cleans! 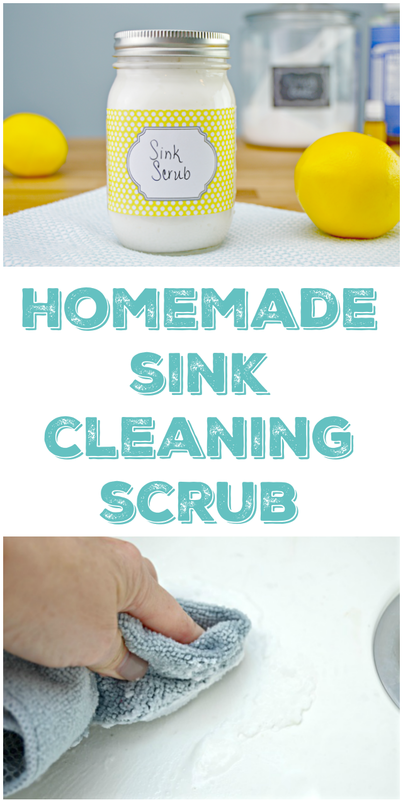 If you ‘d like to see me make my sink scrub step-by-step, you can check out the quick video I made below! Keep reading for the instructions, cute printable cleaning labels and more below! 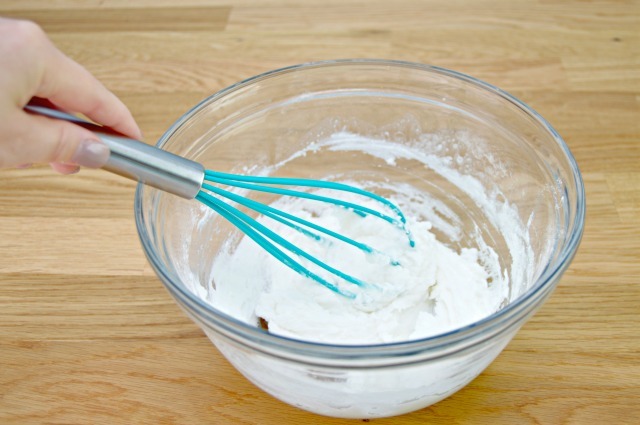 Mix the first three ingredients in a bowl and whisk together. Slowly add a splash of water (about a tablespoon) while whisking until your scrub reaches the consistency of Soft Scrub like you buy at the store. This is similar, without all of the harsh chemicals. If it gets too watery, just add a little more baking soda. Store in an airtight container like a Mason Jar. I like to double the recipe and store in a pint sized Mason Jar (purchase HERE) and I store it right under my kitchen sink so I can use it daily. This sink scrub works great on tomato and red wine stains too! Now…let me show you how well it works! Here is our sink after a typical day. There are a few coffee stains, some smudges and scratches from where I was scrubbing a couple of my stainless steel pots. I just grab a damp cloth and dip it into the scrub, or you can spoon a little into your sink. Just use a cloth or sponge and work the scrub into your sink. I just scrub it all around and let it sit for a second. 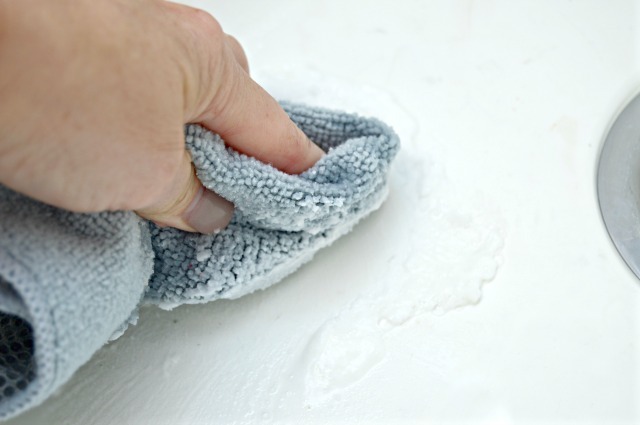 For really tough spots, I use a scrubber sponge to help work the scrub into the stain or scratch. 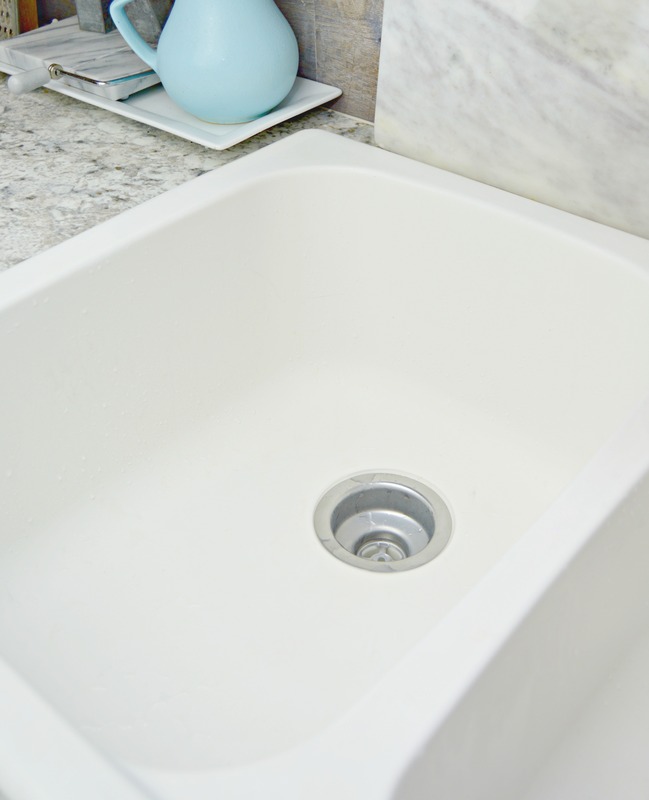 Once your sink is clean, just rinse with warm water. The baking soda, Castile soap and lemon essential oil will also help clean and deodorize your pipes once they are washed down the sink! This scrub really is a miracle worker and works great on porcelain, stone and stainless steel sinks too! It should keep for about 3 months and should be stored in an airtight container. If you’d like to print and use the cute Printable Cleaning Labels like the one above, you can grab them HERE! 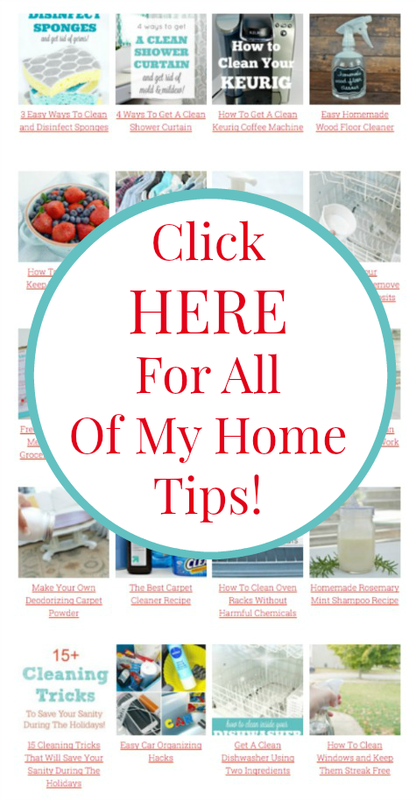 Find all of my home cleaning solutions and cleaning tips HERE!